Syrup of licorice root is a natural herbal medicine. This drug is an effective and safe remedy for coughs, long and very successfully used in medical practice. How to give a syrup of licorice root children? The composition of the syrup of licorice root includes a large number of biologically active substances. Its effect on the body occurs in several ways. 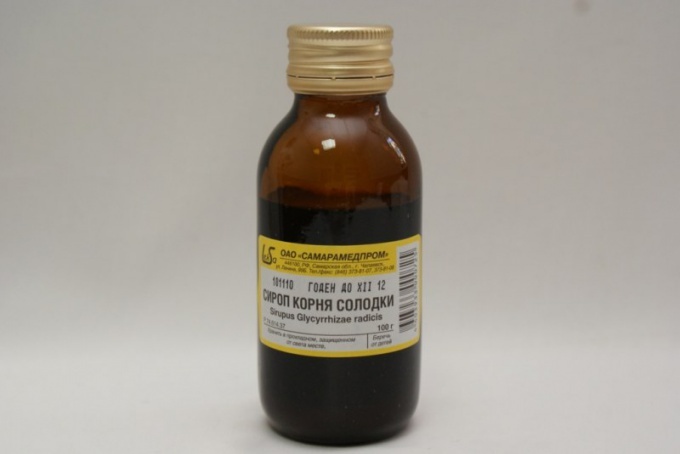 Syrup of licorice liquefies phlegm in the respiratory tract and stimulates its discharge, has a disinfectant action and promotes healing of small wounds of the pharynx that occur when you cough. Use the syrup of licorice root for the integrated treatment of diseases of the respiratory ways, accompanied cough. These include acute and chronic bronchitis, tracheitis, bronchiectasis, pneumonia, tracheobronchitis and other. Syrup of licorice root not only helps to get rid of painful coughs, but also provides the body some amount of tannins that are beneficial to the gastrointestinal tract. Children over twelve years let the syrup one teaspoon three times a day, pre-dissolve it in 100 ml of warm water. It is important to remember that the use of syrup of licorice root should significantly increase the amount of fluid. It is necessary to reduce the viscosity of sputum. Children 6 to 12 years of age dilute 50 drops of syrup of licorice root in half a glass of water, this dose three times a day. Give syrup of licorice root from child 2 to 6 years should be in an amount of from 2 to 10 drops, three times a day, the medication dissolve in a teaspoon of warm water. Kids under the age of two years the drug is prescribed in a dosage of not more than 2 drops in a teaspoon of water, give your baby syrup of licorice root 3 times a day. At any age treat syrup of licorice root for more than 10 days, the need for re-treatment determined by the attending physician. The medicine composition includes sugar syrup, so children with diabetes syrup of licorice root, give with caution. You should not combine the drug with the simultaneous intake of cough drugs. Syrup of licorice root is a natural herbal cough medicine. This is especially true for the treatment of children. The main thing is to figure out how to give it, depending on the age of the baby. Syrup of licorice root consists of a large number of biologically active substances. This drug contributes to liquefaction of sputum in the airway and stimulate her discharge, disinfection and healing of small wounds of the pharynx that occur when you cough. Licorice root is a great remedy for the treatment of chronic bronchitis, tracheitis, bronchiectasis, pneumonia, tracheobronchitis, and so on. The first condition in the treatment of syrup of licorice root is to drink plenty of liquids. It is important to reduce the viscosity of sputum. Otherwise, the mucus will become thick and will cause difficulty breathing. Dilute the syrup in boiled warm water. You cannot add the syrup in tea or hot drink, as under the influence of temperature considerably reduces its useful properties. Kids under 2 years let's licorice root 2 drops diluted in a teaspoon of water 3 times a day. Syrup of licorice root for a child from 2 to 6 years plant in the amount of 2-10 drops in 1 teaspoon of water and give 3 times a day. Child from 6 to 12 years of age dilute 50 drops of this medicine in half Cup water and give 3 times a day. 100 milliliters of water dissolve 1 teaspoon of syrup of licorice root. This dose is intended for a child older than 12 years. You need to take medicine 3 times a day. At any age the course of treatment syrup of licorice root should not last more than 10 days. If necessary, the repeated course must consult the child's doctor. Syrup of licorice root is contraindicated in children suffering from diabetes. The correct application of licorice root will help to get rid of a cough for a short period of time, as the early stages of the disease, and in the process developed the infection. Most importantly – stick to the above dosages and do not change treatment regimen at their discretion.